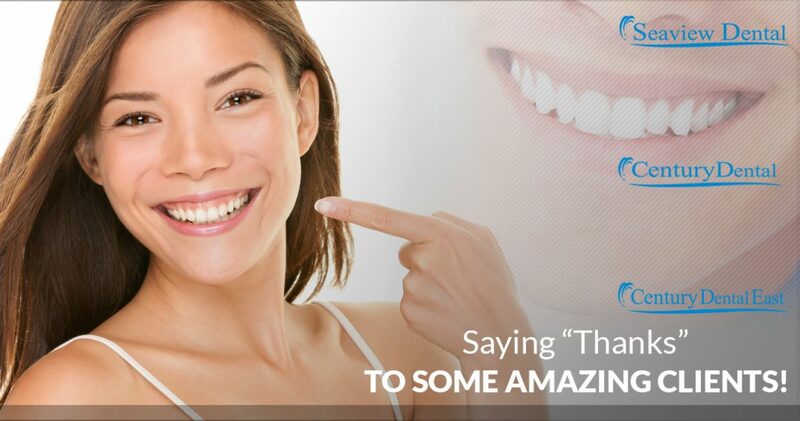 Dentists Near Me: See What People Are Saying About Our New Jersey Dentists! Saying “Thanks” To Some Amazing Patients! At our three New Jersey dental clinics (Century Dental in Jackson, Century Dental East in Pine Beach, and Seaview Dental in Eatontown) we truly treat our patients like family. From the moment you walk through those doors, we want you to feel welcome and confident that you have chosen the best dentists in town. We have a team of five spectacular dentists (Drs. Port, Cohn, Garland, Griepenburg, and Oliveira) who are all incredibly skilled and experienced. While some have specialties (Dr. Port, for example, has placed over 19,000 dental implants), they each are dedicated to providing the best care to their patients. Our dental hygienists are also the best in the industry and are committed to making you comfortable while you’re in our office. In short, we think you can’t go wrong with any of our three dentist offices in the area. But, don’t just take our word for it. We would be nothing without our patients, so we’ve collected a little feedback from them to help show our commitment to giving you the best experience when you come into Century Dental, Century Dental East, or Seaview Dental. Keep reading to discover some of our favorite online reviews we have received over the years, or head here to get in touch with our offices and request an appointment. We offer general and cosmetic dentistry ranging from simple cleaning and professional teeth whitening to more complex procedures like periodontal treatment and dental implants. At the end of the day, our goal is to provide excellent dental service that works for your budget while creating a better and healthier smile. Get in touch today to schedule an appointment! Thanks for your kind review, LB! We certainly know the apprehension of switching dentists after going to the same doctor for as long as you can remember. Thankfully, you chose one of the best dentists in Pine Beach to take care of you! Dr. Cohn is incredibly experienced and has perfected his craft throughout his time in the industry. At Century Dental East, Century Dental, and Seaview Dental, we believe that explaining what we are doing to patients can take away some of the stress of a dental checkup, and we’re glad you benefited from that! We look forward to welcoming you back! “This is likely the best Dental Practice in Ocean County and possibly New Jersey. 1) The moment you walk in you are greeted with the most welcoming smiles. 2) The prices are extremely good and the skill level is AAA+. 3) The hygienists are impeccable. 4) Dr. Todd Garland is a master at his trade and gets the impossible done with minimal pain and minimal cost. I’ve called with a chipped tooth and other issues at off-hours and they’ve gotten back to me, willing to meet me even though they were closed. They fixed issues that I came in with from other Dentists from other practices! My most recent experience was four crowns on top four front teeth that gave me a completely new smile, one that I am happy to wear. The price and quality of the work makes this the first place you should come to. Don’t waste your time going to those other places advertised, promising a new smile! You will save tons of money and be very happy by coming here first. Dr. Todd Garland is a master worker and gets the impossible done at a price you can live with. Orlando, thank you for taking the time to write such a kind review! We believe you captured exactly what we try to do at our three dental offices. We want people to feel comfortable when they walk the door, we want to work with your budget and offer payment plans that meet your needs, and we want to be masters of our trade so you always feel comfortable coming back. Jeremiah, we are thrilled to read this review! One of the biggest compliments a doctor can receive is hearing that their patients recommend them to others, especially when they are trusting us with their family and close friends. We look forward to welcoming you back to our dental clinic! “I was totally afraid of the dentist. I’d put it off until I have no choice because I’ve broken something, I have pain, etc. once I get there I go into a full blown panic attack. Well no more!!! Jessica, we’re sure your review echoes the feelings of so many others! Thank you for being open and allowing us to help get you a wonderful, healthy smile! A lot of people have told us that they have dental anxiety, or perhaps they had a bad experience at another dentist. At our dental offices, we truly care about your oral health and do everything we can to make coming to the dentist a good experience — and maybe, just maybe, a little bit fun? It’s just another way we prove that our patients are like our family. At the end of the day, we don’t need to tell anyone that the best way to prevent major dental problems is regular checkups and cleanings. The longer you go between visits, the longer a small problem has to become a major health issue. We would love to welcome you into any of our three locations for a checkup and cleaning. Get in touch today to schedule an appointment with our New Jersey dentists!